Bright and satisfying, this soup is open to whatever vegetables you have in the fridge and hearty enough as a stand- alone meal. 1) Heat 1 tbsp oil and butter over medium high heat in large soup pot. Add onions, sweat for 5 minute, add garlic, celery and carrots. Saute until vegetables are beginning to glisten, about 5 minutes. Season lightly with salt. Remove from pan and set aside. 2) Heat oil in same pan over medium heat, add turkey, breaking down into small loose pieces. All Lemon Rosemary Garlic Seasoning with a light grinding of salt, tossing until blended throughout. Cook until no longer pink, about 10 minutes, stirring often. Add chicken stock, bring to a simmer. Add carrot, celery mixture back into pot. Stir in lemon juic. Simmer about 15 minutes. 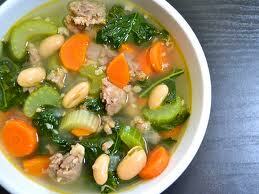 3) Throw kale and white beans into the soup pot and with lid on steam about 5 minutes. Remove lid, add parsley, lemon zest. Simmer 2-3 minutes, adding more chicken stock if soup is too chunky. Season to taste with salt and pepper.